Welcome to SimLeague Baseball (SLB) from WhatIfSports.com, where you have the opportunity to build and manage a team of all-time greats as you compete against 23 other users in a full 162-game regular season schedule. Dream matchups from baseball lore come to life. Ruth vs. Clemens. Bonds vs. Koufax. Aaron vs. Johnson (the Big Train or Unit). You may choose a league and salary cap option and build your team of 25 players from 1885-2010. As soon as you are in a league, you may access the League, Manager’s and GM’s Offices to see stats or make lineup and roster adjustments. Once the league fills with all 24 users, the season is ready to begin. SLB utilizes WhatIfSports.com’s acclaimed simulation engine to “play” three games a day per league. Games include an extensive boxscore complete with descriptive play-by-play, detailed stats and incredible depth. The Player’s Guide is designed to help all SLB users from Rookies to Hall of Famers as the most complete and user-friendly resource for all things SLB from joining leagues to drafting teams to managing lineups and pitching staffs. Each topic includes a relatively higher level explanation of the topic as well as relevant screen shots. For even more detailed accounts of each topic including the ability to search for a question/answer, please consult the SLB Knowledge Base. Also for new users, or for veteran users who would like to try a new strategy, we recommend free Spring Training Leagues. These leagues consist of just six users, but allow for full managerial control and ten games. 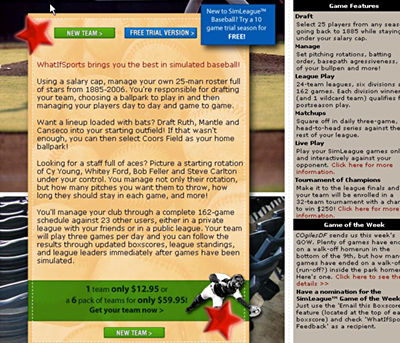 Spring Training Leagues are a good way to learn about building teams, using managerial options and reading boxscores. Each WhatIfSports.com user is allowed up to one Spring Training League per month. 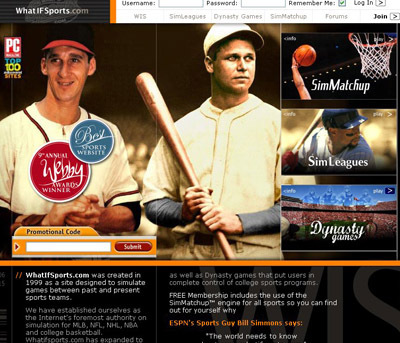 ↑ WhatIfSports.com - The Internet’s foremost authority on sports simulation.